The Lime 3x3 dish is the best new part to come from The LEGO® Movie, hands down. As soon as the first pictures of Cloud Cuckoo Palace surfaced online, I knew I needed that dish, very badly. I'm always looking out for new colours to make robot turtles. Look at them. Aren't they adorable. So the turtle rainbow now looks like this, which pleases me. It's nice to have one of the little guys occupy that area of the colour wheel. In celebration of this new turtle colour I've made some Lime variants, featuring exciting upgrades and new, previously unseen weapons. Lime is a surprisingly cool colour to work with - there are some nice little fiddly parts, and some rare ones like frying pans and 1X4X1 little fences. I've become dependent on the syringe while making these, and maybe I was chasing the first thrill. As detailing parts go, the needle's all you need. 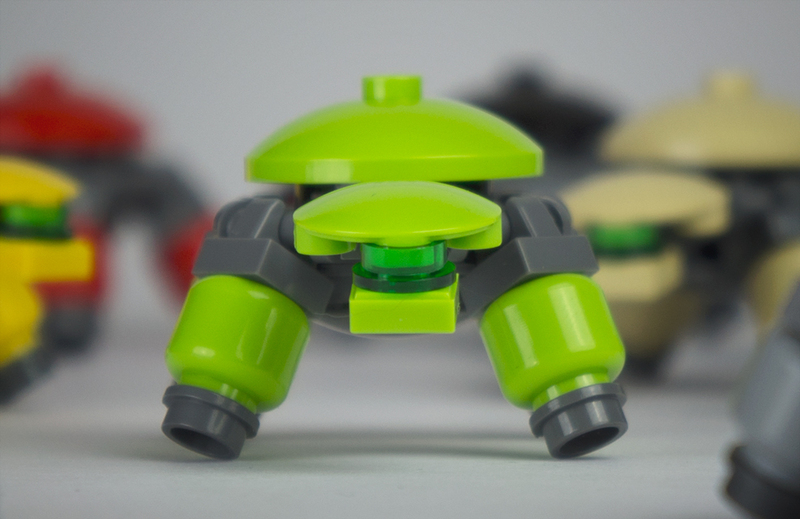 Over the past few weeks I've not stopped thinking about Lime turtles, and one thing led to another... it seems an exciting new LEGO element can turn me into an experimental weapons developer. From the future. Special thanks to Chris Salt and James Shields for their hard work on this film. If any LEGO Designers would like to help me make more turtles, I'd like boat studs in brown, dark blue and pearl gold, please. I heartily second Pete's thanks to Chris and James; what a cool film! And huge thanks to Pete too for making all this for us. If you're in need of more turtle motion, check out this clip of Pete's eye-popping build with Simon Burfield; the turtle factory. Still insatiated? There's more turtle goodness on Legoloverman's photostream. As you can't fail to notice, the 3X3 Lime dish is not the only new thing in Cloud Cuckoo Palace. The set is a riot of new elements, more so than any other from The LEGO Movie. If I was being judgmental I'd state that the wild colours of these new elements render them pretty useless, but given what Pete's just showed us, that's obviously not the case! I discussed the amazing constituents of Uni-kitty (or rather, Biznis Kitty) in my review of 70809 Lord Business' Evil Lair. Her neck isn't the only Yellowish Green [BL]/Spring Yellowish Green [TLG] part in Cloud Cuckoo Palace; there's a 1X4X5 wall piece with arched window. In my previous post I mentioned that 70804 Ice Cream Machine has a 2X2 round dome in Spring Yellowish Green, so it feels like this colour is making a proper entry into System in 2014, although we're a long long way from having enough parts to achieve much. 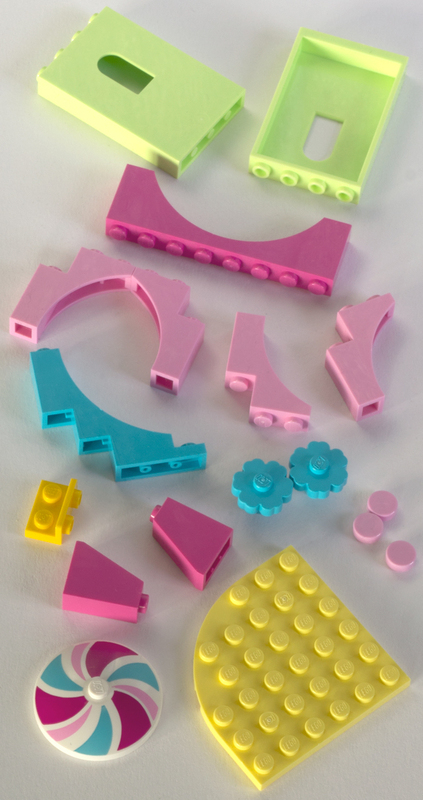 A number of arched bricks come in new colours in the set too: the 1X8X2 arch is in Dark Pink [BL]/Bright Purple [TLG] (Element ID 6059172 | Design ID 3308), there are four of the new 1X3X3 Gothic arch in Bright Pink [BL]/Light Purple [TLG] (Element ID 6059160 | Design ID 13965) and the 1X5X4 inverted arch is in Medium Azure (Element ID 6059165 | Design ID 30099). The latter also now appears in 71006 The Simpsons House. Other new elements are the 1X2/1X2 inverted bracket (Element ID 6057458 | Design ID 99780) in Yellow [BL]/Bright Yellow [TLG], the Medium Azure flower brick (Element ID 6059181 | Design ID 98262), round 1X1 tiles in Bright Pink (Element ID 6055380 | Design ID 98138) and the Dark Pink 2X1X2 65° slope (Element ID 6062343 | Design ID 60481). Bright Light Yellow [BL]/Cool Yellow [TLG] got a big boost last year in 41005 Heartlake High; we now get a 6X6 plate with curved corner in this set (and 41035 Heartlake Juice Bar has two). There are also a couple of printed 4X4 dishes, one of which is a lovely new spiral print (Element ID 6068033 | Design ID 17161). Overall this set feels more like a display model to me, but a very entertaining one. I'm tempted to keep this model on show just to see the reactions of my Muggle friends who will probably coo over it whilst complaining LEGO isn't like it used to be when they were kids. The play functions are OK but extremely basic. You can turn the spiral dishes using a gear at the back, but it would have been much more fun to push a lever to make them spin. Speaking of absent levers, that stick holding up the sun is not a lever; it just adds some angular wackiness to the design. The catapult presumably ties into whatever chase drama is underway in the movie at this point, so seems appropriate for inclusion in the set, but isn't a lot of fun for me. Although the structure of the palace is rudimentary, there are three areas to position figures in - the two floors of the palace and under the archway - and these are decorated with lovely colourful round tiles. Although the spaces are small and minifigs tend to fall out easily, I can picture kids mostly using this set to act out scenarios, especially as you have a whopping five figures to play with (three minifigs and two brick-built characters). If I can be a little picky; I'd have liked some more cloud. Having the catapult as a separate object from the palace helps to give some sense of environment, and I feel one or two more of these clouds would have made this set more fun to arrange. Of course it's easy to add your own clouds but I'm a little short in the white curved brick department! I'm sure kids will be happy to use any white bricks they have to hand. A lot of men (not just me!) seem to like this set, which is refreshing. 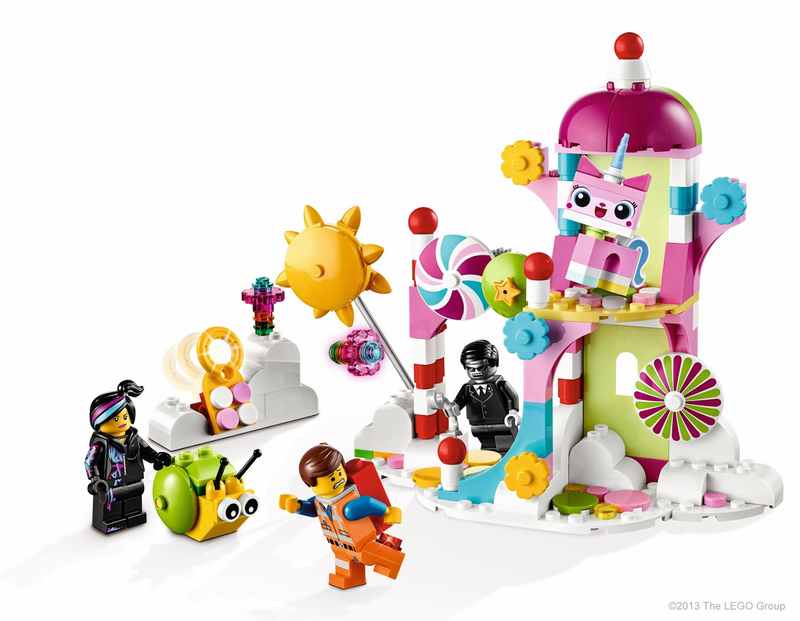 It seems the self-aware hyper-twee Cloud Cuckoo Land is going to be a very funny and successful concept, and I'd love to see a larger set released - or some huge fan builds! 70803 Cloud Cuckoo Palace retails at US$19.99/GB£17.99. This is indeed a fantastic set for parts. 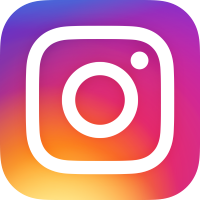 Of course, I'm anxiously awaiting a much wider selection of basic bricks and plates in the current range of pastel colors, particularly Medium Lavender, Light Royal Blue, Cool Yellow, Light Purple, and Bright Purple. My brother and I have plans to try creating brick-built My Little Pony sculptures to sell online or at conventions, but currently there are hardly any of the ponies who can be built at the scale and level of detail we want with existing parts, and those there are require expensive parts in absurd quantities (the only design we've finished currently needs 345 2x2 corner plates in Medium Lavender). Anyway, this was the first LEGO Movie set my twin brother and I got, and I love it. I've had lots of fun playing with the set and figures. Plus, it's just so... new. 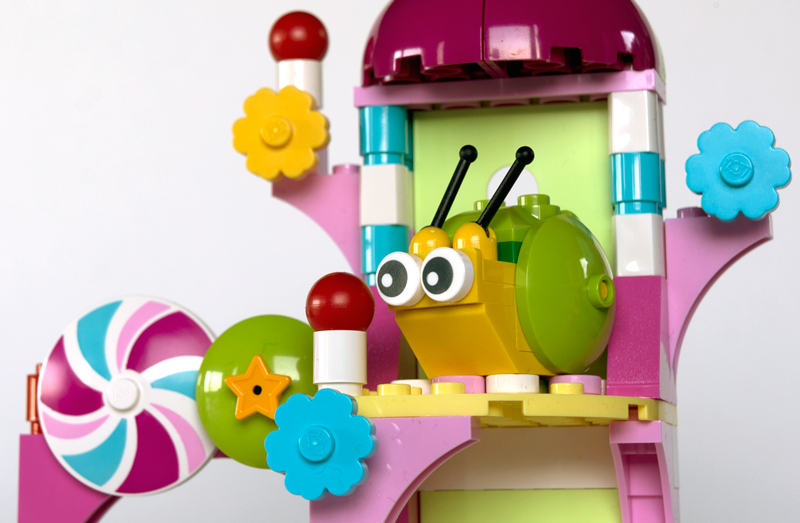 Nothing the LEGO Group has ever released has quite matched this set's abundance of candy-colored whimsy. 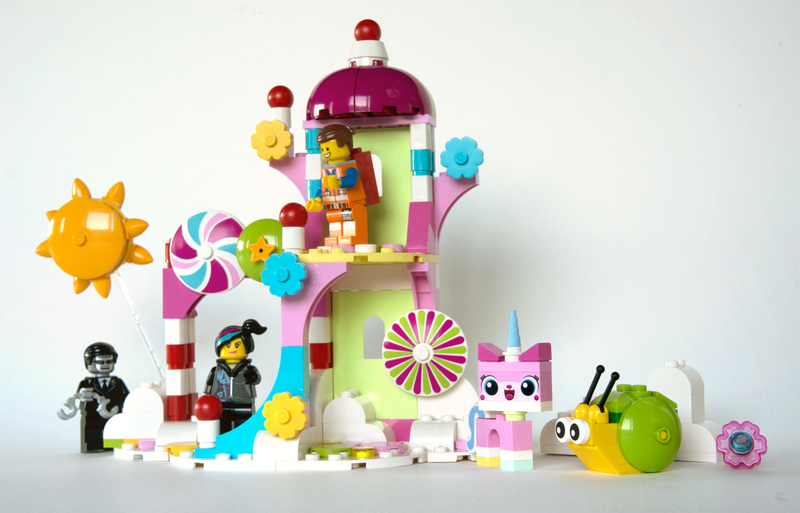 The character of Unikitty alone is something unprecedented in LEGO, but this set takes that to another level. I admire the LEGO Group's boldness in creating a set that has so little precedent in their existing portfolio, and one that might have seemed slightly off-putting to their core audience of young boys. Of the elements in this set, one of my favorites has got to be one that's not new or exclusive but is still the first of its kind that I've gotten — the 1x1 round "eyeball" tile used for the snail! So brilliantly cartoony! It opens up lots of creative building potential, even moreso than the printed "eye bricks" that used to be common in Basic/Bricks & More sets. When I first saw this set, I knew that I didn't just need it—I knew that I'd regret it for the rest of my life if I DIDN'T get it. I hadn't ever seen a set that was quite so hyperactive and pastel and perfect. However, I do agree that it works better as a display piece than as a playset. The flower-launching feature is not from the movie to my knowledge (although there is a basketball launcher in the movie's corresponding scene), and was likely included just to give the set a little bit more playability. The parts in this set are great, though, and there are a lot of tiny parts (including the 1x1 round tiles and all the 1x1 elements from Uni-Kitty) that come as extras as well. One of the 4x4 radar dishes seems to be an update of the classic red and green parasol piece, but instead using Bright Yellowish Green and Bright Reddish Violet (ideal colors if I ever get around to making that modular Frozen Yogurt shop I've been considering building). And more part selection in Cool Yellow is always a nice thing. Spring Yellowish Green isn't particularly useful yet, and the wall elements this set features may not be useful even once the color is more widespread, but it is a good addition to the color palette and it's good to see more part diversity there. One last element note. Although it's far from the only set to feature them (many of the Mixels and Creator sets do, and they're sure to continue being used in the future), this was my first set to feature the 1x1 round tile with the eye print, and I love it already. It's so much more versatile than the classic 1x1 or 2x2 bricks with printed eyes, since you can orient them any which way and put them on any part you desire. The Mixels will be launching very soon, and they'll bring even more cartoon eye elements to play around with. I can't wait. Emmet's face in this set is only in one other set, the Piece of Resistance polybag. I know minifigure parts are not the subject of this blog, but the sheer number of varieties for Emmet's face this year is great—especially since it's basically all variations on the classic smiley, which should be a godsend for people who want to make Brickfilms and need a character with a wide range of emotions. If there was any one set I'd like to see reviewed by you it would be Spinlyn's Cavern. but how did you get the 1x1 wedges at the feet?